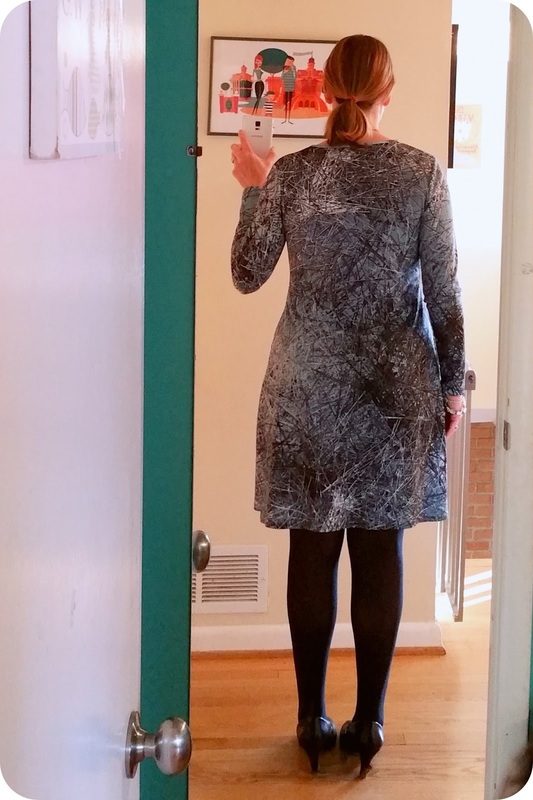 Fabric Mart Fabricistas: Made by a Fabricista: Ottobre Halston Nail Print Dress. Made by a Fabricista: Ottobre Halston Nail Print Dress. I really love this month's make. I usually have a very strong idea of what fabric I want to work with and then I find a pattern, but this time, it was reversed. 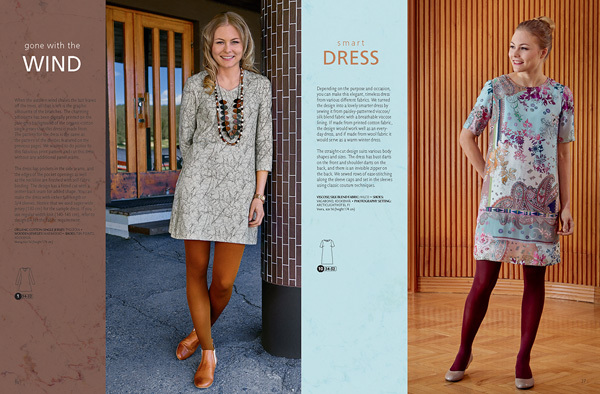 I had the 05-2015 Ottobre sewing magazine in my library, and I really was digging the Twig Dress (#1). I had seen it on Ann (a fellow fabricista) and so I knew how cute it could be, but I really wasn't sure from what fabric I should make it. As is usual for me, though, I did my daily digging at the Fabric Mart site (I am addicted! 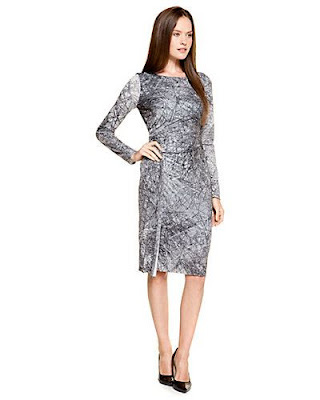 ), and in the new arrivals was this glorious medium weight Halston printed knit fabric with a nail print. 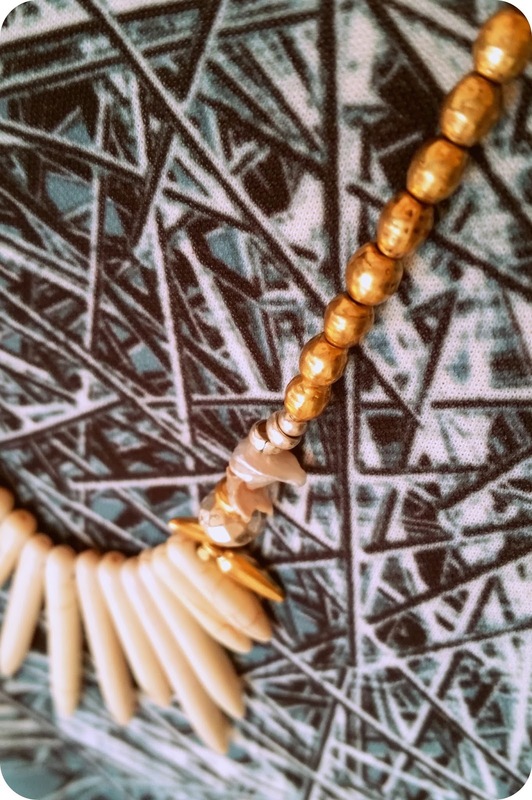 I really dig abstract prints, and I like that from far away it looks like ice or broken glass, but upon close inspection, you can see that it is a digital print of many nails spilled on a surface. The minty blue-green, grey, and white coloring was also very appealing to me, so I told Fabric Mart to send me some of that to make the Twig Dress! Above, on the left, is the Twig Dress. As you can see it is quite short on the model, who is my height, btw. I did have to lengthen mine by 2.5 inches, and I took up the barest amount on the hem. I do know I could wear it with leggings to school, but I often want to wear tights or bare legs, so I prefer to lengthen it for versatility. 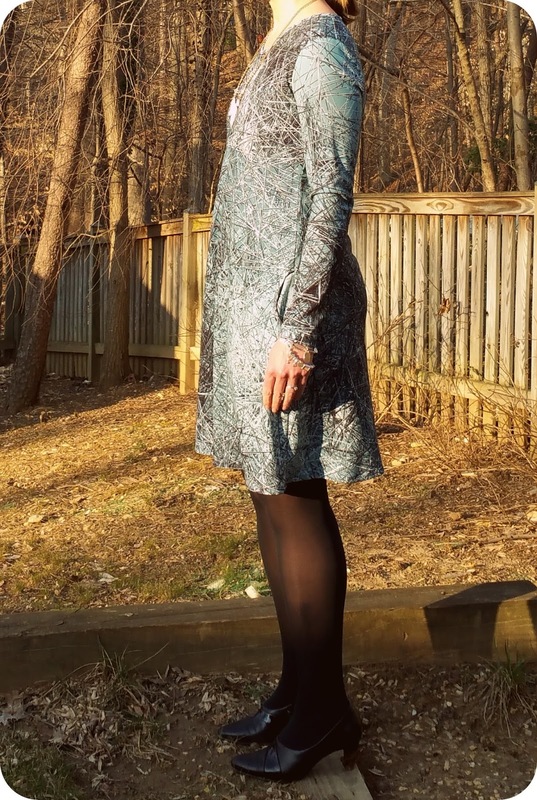 I hadn't realized I had used the other sleeve length rather than the 3/4 length one on the Twig Dress (there were two lengths), but I am glad I did. I lengthened that one by 5/8" and after hemming, the length of the longer sleeve is hitting exactly where it should. Here is a super close up of the nail print. It is utterly fascinating to look at. The composition of the fabric is not like your typical knits. It is like a double knit, so it lays nice and flat, and while it has a bit of stretch on the cross-grain, it has none with the selvedge. It is called a poly crepe interlock, and unfortunately this particular fabric is sold out. There are a few yards left of the nail print silk chiffon, though, here and here. Onto Ottobre...it appears that they are sized similar to Burda, so I went ahead and cut a size 38 at the shoulders, bust, arms, and waist, and graded to a 40/42 at my upper hip and lower hip/hem. I probably could have gotten away with staying 38/40 or a straight 38. 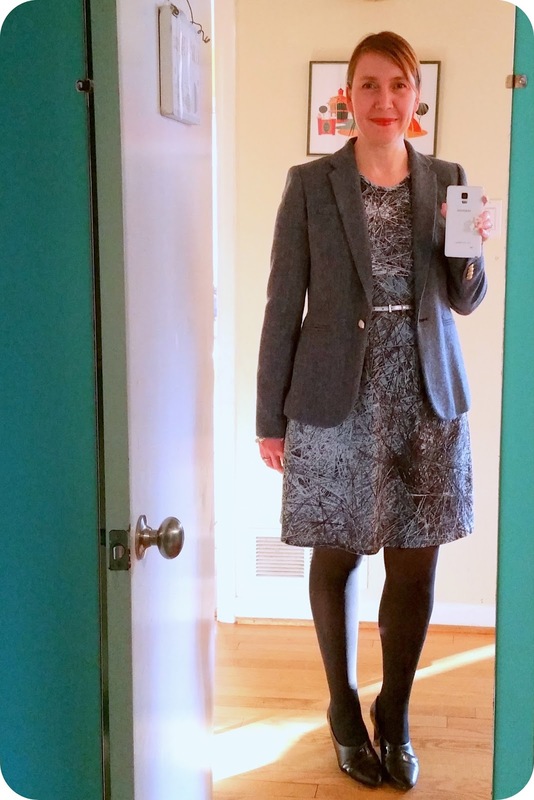 The folks at Ottobre may have a pear shape fit model since I had plenty of extra volume in the skirt after grading. 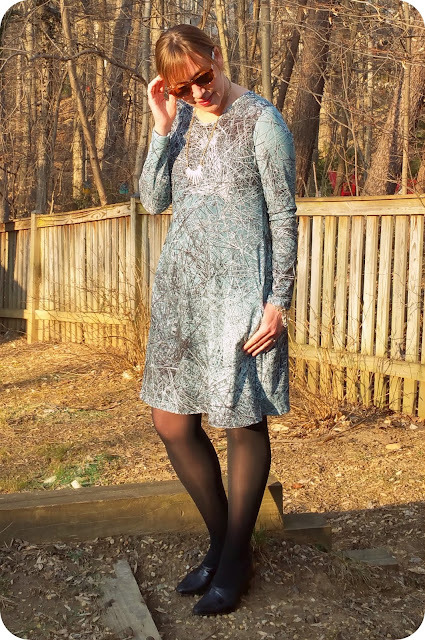 Had I wanted the dress to fit as it does the model, I would have had to stay with the straight 38 throughout. 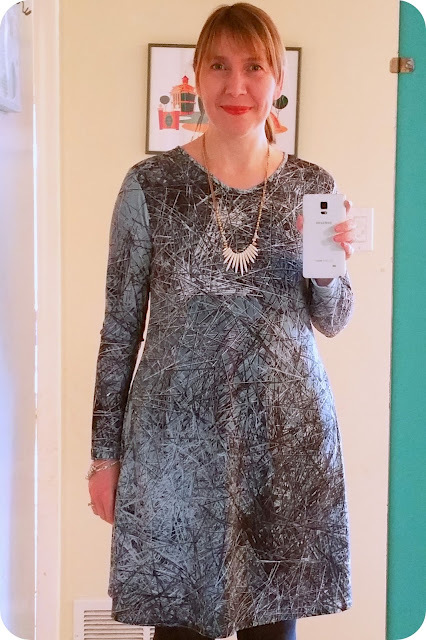 It is good to know that for next time, but I love the dress as is, so I am for sure fine with the change I made in the sizing. There are no darts, etc., so if you have any need to make a full bust adjustment, I would do so. I am not sure what cup size Ottobre drafts for, but if my barely Bs fit into this and there are none of the usual extra room "wrinkles" I often get, then that tells me that at least in the smaller sizes, they draft for a smaller cup size. BTW, the v-neck is not really a v-neck. I didn't add the dart like they suggested in order to create the v, and though I toyed with the idea, I actually think I like it better a bit more rounded. I am not the only one, most of the Twig dresses I have seen on the internet have also been of a rounded neckline and not of the v-variety! Here you can see the length best. It hits at the top of my knee, so 100% appropriate for my job, with tights, leggings, and bare-legged. Okay, that's it for this month. I have to say once I got the pattern traced, the rest of it came together pretty quickly. The fabric was very easy to sew and the instructions, while sparse, had just enough info for me to sew it up in a matter of hours. If you are just starting out, these instructions may not be enough, but for advanced beginners and up, this is a delightful, quick, and easy sew. Oh it's fantastic! I love the print so much. Very cute! The print is wonderful, somehow I missed this fabric on the Fabric Mart site? Perfect for a shift. Cool print! Hate that there is only chiffon left in this fabric. Your dress looks great. I like it with the belt and jacket! Very pretty, Dina! I'd been eyeing that print too. Love it with the blazer- the pairing of the conservative grey solid with the super mod print works really well. 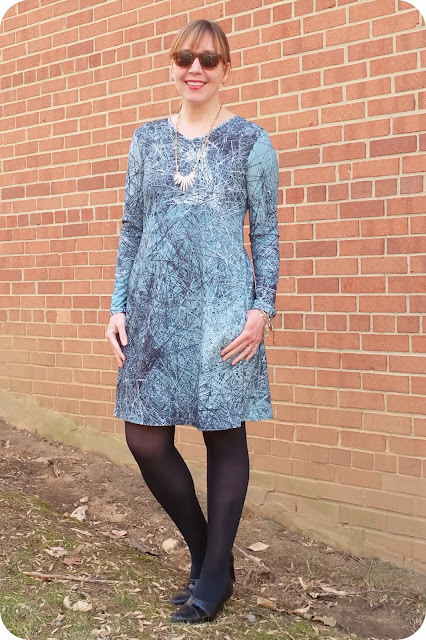 Just beautiful Dina, I love the fabric and seeing it sewn into a beautiful dress brings out the unique look of the print. I saw this print but I guess I didn't have the imagination to see the possibilities, silly me. Great job and thanks for sharing. Super flattering dress for you!! And what a cool print.